These tasty little French dishes make a great starter for a dinner party. Ahead of time, clean and slice the mushrooms, gently fry in a little butter on both sides, remove and place on some kitchen paper to remove the excess fat. Add a little olive oil to the same pan and fry the lardons; remove and again place on kitchen paper. You can then cover with film and place in the fridge until needed. Place the creme fraiche in a small bowl and, with a fork, whisk with some salt & pepper and the nutmeg. Finely chop the chives. 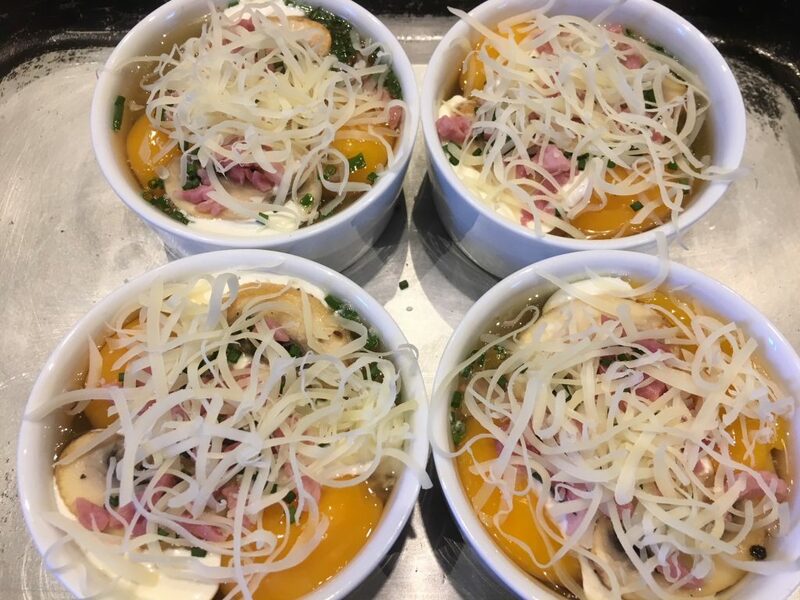 Place one tablespoon of creme fraiche in the bottom of each ramekin; add two slices of mushroom, a few of the lardons, a few chopped chives and then the egg (you may find it easier to crack the egg into an espresso cup first, if the eggs are small you can add one whole one, plus one yolk). Repeat by topping with the second tablespoon of creme fraiche, mushrooms slices, lardons & chives. Top with a little of the grated cheese and you can then place back in the fridge for up to an hour before you are ready to cook. Boil your kettle; heat your oven to 180c. Place the ramekins in a roasting tin and gently pour the boiling water around them so it comes half way up the ramekins. Bake for 15 mins. To serve, remove the ramekins from the water bath onto a clean tea towel to absorb any water. Place on a small plate, lined with a small napkin.